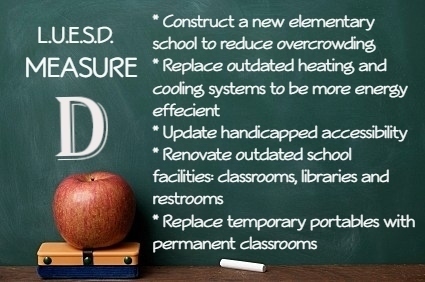 Measure D will provide the funds needed to make critical facility improvements at Lemoore elementary schools. Measure D makes financial sense and protects taxpayers. All funds must be spent locally and cannot be taken by the state. By law, spending must be reviewed and annually audited by an independent citizens’ oversight committee. Funds can only be spent to improve our local schools, not for administrator or teacher salaries.